Our cabin has 2 main bedrooms downstairs with a third mezzanine bedroom upstairs and can sleep up to 6 guests. It has a bathroom with a shower downstairs and also a sitting room area with a view over the lake. The kitchen is open plan with the sitting room and has everything necessary to enjoy a self catered weekend away. 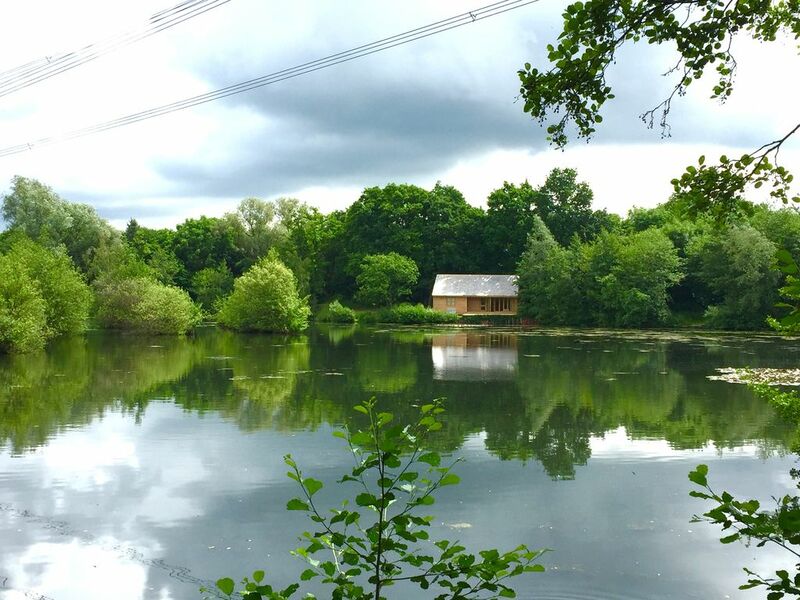 The cabin is in North Essex, in the hidden gem of the Colne Valley, very close to the suffolk border and about half an hour from the coast. We have lots of beautiful walks and cycle routes nearby with many great pubs and restaurants. Dining table for 6 in kitchen area. The cabin is every bit as good as the photos suggest. Very nice property in an idyllic setting. Very peaceful, comfortable, well equipped and spacious. The hot tub is an added bonus. We were very pleased that we had booked the cabin and would recommend it to anyone holidaying in the area. Thank you Arcihie for a very pleasant stay. Absolute pleasure to share it with you.Thanks Rodney for leaving the cabin in such great condition! A well equipped property in a secluded spot. We went for walks in the woods, saw a kingfisher, visited the railway museum, local pub in Chappel and enjoyed eateries in nearby Earls Colne. Noticed they plan to build three more properties though so level of seclusion will go which is a shame. Everything you need for a relaxing getaway. Comfortable beds, beautiful setting, well equipped- you wont be disapointed! Sorry about the confusion Lisa, it was a shame the fish were spawning at that time. Glad you had a great time though and thanks for leaving the cabin as you found it!